Meeting with Dr. Jenny Tonge goes ahead despite sustained attacks by the Israeli lobby. Thanks to everyone who came to the meeting at venue#3. This is the press release we sent out after the meeting. We know of 11 Palestine meetings that have been attacked by the Israel lobby over the last 2 - 3 years (most, not all, were able to re-locate), but this was the most malicious and hateful of them all. So we see this as a major victory for free speech. We were pleased that author and musician Tom Suárez was able to join Jenny for the Question and Answer session. His most recent book is "State of Terror: how terrorism created modern Israel." Thanks to everyone who gave donations. We collected £257.02 for MAP (Medical Aid for Palestinians) and ICAHD (Israeli Committee Against House Demolitions). Building for Peace in Palestine. 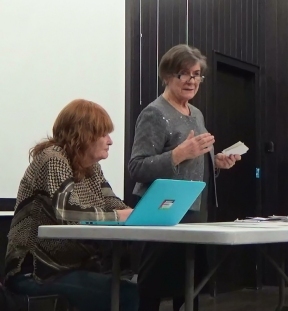 Report back from a recent ICAHD (Israeli Committee Against House Demolitions) tour of the West Bank with Hastings PSC member and local Unite community organiser Gill Knight. Quaker Meeting House, 5 South Terrace, Hastings, TN34 1SA. 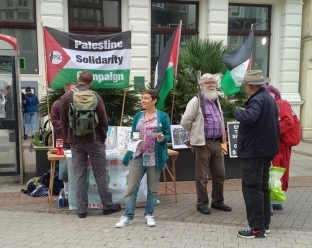 Article in the Hastings Online Times: Building for peace: first-hand news from Palestine. Organised by Hastings Against War. Comedian, champion of Palestinian rights Jeremy Hardy dies aged 57. 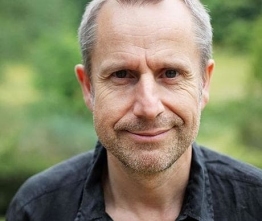 Very sad to hear that comedian Jeremy Hardy died on Friday. He was a great supporter of Palestine. He travelled to Bethlehem in April 2002, right after the siege of the Church of the Nativity. Here he made the film Hardy vs. the Israeli Army. Jeremy supported numerous campaigns for social justice from the the miners strike, the plight of refugees to the Guildford 4. Life under occupation: Israeli military shoot dead 17 year old at a picnic. Ayman Hamad was shot through his chest from the left, below his neck, and exited from his hip. When one of his friends Mohammed tried to approach, to pull Ayman out of the line of fire, another shot rang out. Mohammed was hit in the arm and ran for his life. Palestinian Teen Hiking With Friends Was Killed in Israeli Army Ambush. He Posed No Danger. Keep human rights monitors in Hebron. 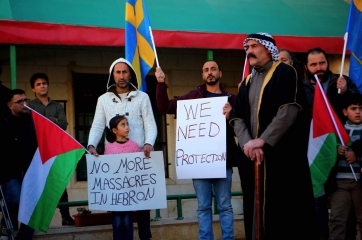 The organisations TIPH (Temporary International Presence in Hebron) and EAPPI (Ecumenical Accompaniment Programme Palestine Israel) have had an impact on reducing the amount of harassment and violence against the Palestinian community in Hebron. "Incidents of settler violence in Hebron are already at extremely high levels and coming new settlement construction in the area is likely to make this even worse." TIPH has now been expelled by the Israeli government. This has been followed by the World Council of Churches (WCC) withdrawing volunteers with EAPPI from the city, "citing security concerns due to the level of settler harassment internationals have been subjected to by settlers under the eye of the Israeli Occupying Forces." Petition calling upon the UN and EU to condemn the expulsion of TIPH. 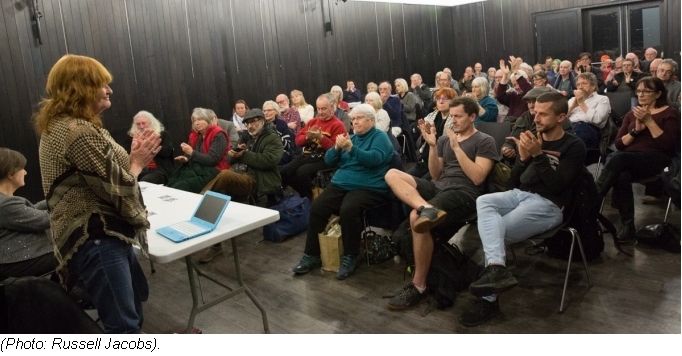 This is Eastbourne's first public meeting. The branch will be hosting Benjamin Ladraa, the Swedish peace activist who walked from Sweden to Palestine to raise awareness of the human rights violations against Palestinians that he witnessed during his 3 week visit to Palestine in 2017. They will also show a short film. And there will be Palestinian food. St Elizabeth's Church Hall, Victoria Drive BN20 8QX. Call to press for Eurovision to be moved from Israel. 50 figures from Britain's creative industries - including Peter Gabriel, Mike Leigh, Vivienne Westwood, Ken Loach, Julie Christie and Roger Waters - have called on the BBC to cancel coverage of this year's Eurovision song contest because it is taking place in Israel: The BBC should press for Eurovision to be moved from Israel. 60 human rights groups back international call to boycott Eurovision in Israel. The Tuts turned down representing UK in Eurovision as it's being hosted in Israel. NO to culture-washing, NO to pink-washing, NO to Eurovision being hosted in Apartheid Israel! Love Eurovision, Hate Apartheid! Facebook event page. Free Palestine - music from Ghana. We've been sent a reggae song from King Jomo and World Voice Band, based in Ghana. Israel plan to displace 36,000 Arabs in Negev. Palestine in Pictures: January 2019. 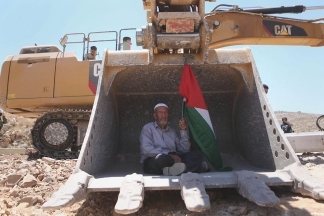 Palestinian Demolishes His Home In Silwan To Avoid High Penalties. After years of study and discussion, Jewish Voice for Peace rejects Zionism. From April 2018: The Failures Of Western Reporting in Gaza. Screening Ban of Pro-Palestinian Film Casts Shadow Over Spain's Goya Awards. Asa Winstanley: Fake Labour accounts fueling "anti-Semitism crisis." Irish Parliament Votes on Banning Imports from Illegal Settlements. Tourism companies driving settlement expansion, profiting from war crimes. We run fortnightly stalls on the cobbles at the top of Conduit Hill, where it meets the High Street. 11 - 1 pm. For anyone in the Rye area who wants to help out, please contact us.